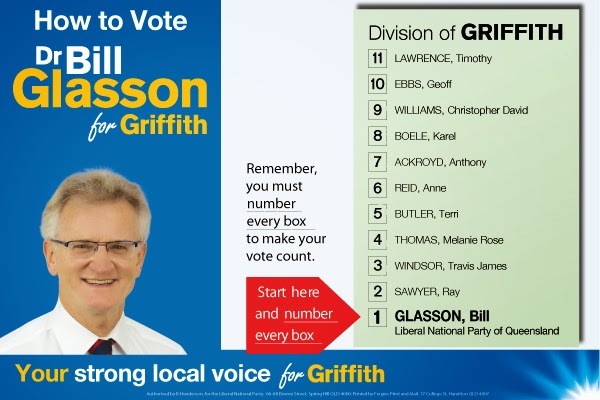 There is a cricket team of candidates for the Griffith By-election on 8 February 2014. Nine of the eleven candidates represent registered political parties, but will electors really have any idea about who or what they are voting for in Kevin Rudd’s old House of Representatives seat? The 2013 Senate results exposed some of the bizarre idiosyncrasies resulting from our compulsory electoral system: we have to vote and we have to allocate preferences to all candidates. The party names will be written on the Griffith ballot paper so that should help, shouldn’t it? If you choose the Bullet Train Party, you'll know what comedian Anthony Ackroyd will be fighting for if he wins. He may have to give up his impersonations of Kevin Rudd. However, it won’t be hard to take the mickey out of himself since he will be required to abstain from voting on any matters except the train. Now that’s taking a lot of taxpayers’ money for very little jam. At least Family First’s candidate Christopher Williams could follow the example of former senator Steve Fielding who often made up policy on the run. In the absence of a hung parliament, he’ll have to rely on FF’s South Australian senator-elect Bob Day who doubtless will continue the traditional of backroom deals. The Secular Party has lots of the policies you might expect: no religion in schools, support for an Aussie Republic. It stands for a carbon tax but against emissions trading schemes. Some voters may be surprised to know that they are pro-abortion and strongly favour Australia participating “in all stages of the nuclear fuel cycle, including power generation and waste disposal”. Presumably, these will not be located in Griffith’s backyard. I pledge my loyalty to Australia and its people, whose democratic beliefs I share, whose rights, liberties and values I respect, and whose laws I will uphold and obey. The list of shared values will be found in an expanded Australian Values Statement. The secularists want “Evidence of compliance with the Australian Values Statement, such as witness statements, …before permanent residence visas and citizenship are granted.’ If you’ve forgotten or never heard about the Statement, you’d better rush to read it before you vote next. It involves ‘a shared identity, a common bond’ that all Aussies accept implicitly, don’t we. Timothy Lawrence may be regretting the shaky status of his party’s name, which will soon change from the one on the ballot paper to the Sustainable Population Party. The thesaurus doesn’t have them as synonyms. The current name could easily be associated with right-wing anti-immigration parties while ‘sustainable’ has definite green connotations. Ray Sawyer is wearing the hat for Bob Katter’s Australian Party, having gained only 1.92% as candidate for the seat of Fairfax in 2013. They directed their second preferences to Clive Palmer and his eponymous party, who won that by a nose, but PUP has squibbed this contest. According to independent Karel Boele, “He supports needs-based education funding and an effective solution to climate instability, for example an ETS. He supports improved discussions and trade with neighbouring countries, and a no offshore processing by Australia policy for refugees.” He is independent. Or is he? He runs the People Decide platform and will vote on Bills in Parliament directly through the Internet. Now that’s a real pig in a poke. He will vote on each Bill in accordance with the majority of votes. It’s a bit murky as to how he will vote on amendments. The Liberal National Party has put its faith in the reverse donkey vote in its preference allocation. Their preferences go from Bill Glasson, bottom to top. At least one well-known Queensland Lib thinks independent Travis Windsor is worth a look. 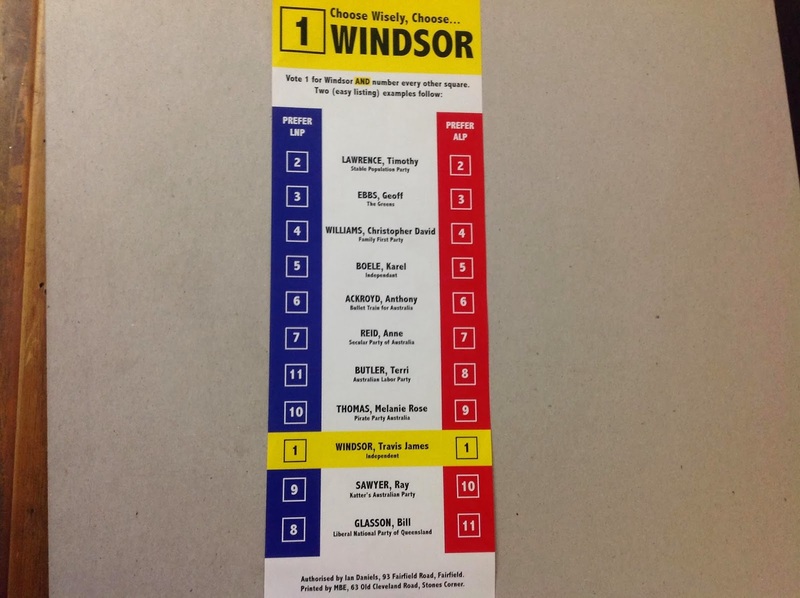 Could we stand another independent T. Windsor? Could make for some messy googling. He’s splitting his preferences but in each case The Greens are ahead of Labor or the Coalition. The Stable Population Party (SPP) is using environmental and community groups to 'green wash' its anti-immigration message and split the Greens vote at the Federal election. Next comes the Pirate Party of Australia, which shares lots of policies with The Greens and their other fancied micro-parties. Nothing illegal of course, PPA’s core business is not piracy, but freeing up copyright. However, they could be labeled copycats on many other issues, as could many of the others. It’s good to see so much agreement with marriage equality, climate change trading schemes, and humane treatment of asylum seekers. Their other two Greens’ preference choices fit that bill. However, The Greens can’t be jumping for joy over the Secular Party’s nuclear stance. Karel Boele is a policy loose cannon for a different reason, as he’s going to follow direction from voters online. Nevertheless, they’re happy to put him ahead of Labor. 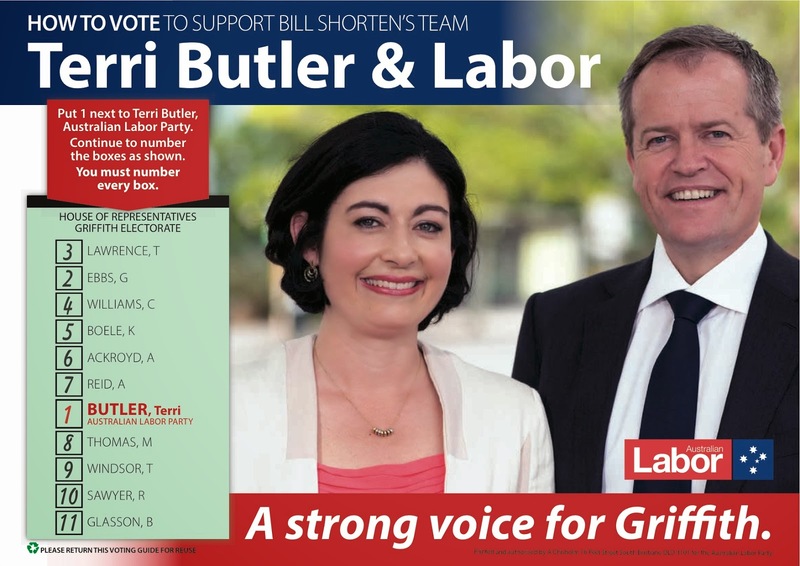 The ALP’s Terri Butler has The Greens second on her how-to-vote card, and then just numbers down the ballot paper. Less informal votes that way. There is no potential controversy as could arise if we had One Nation progeny in this field. Now if you fancy any of the other candidates, please see what you can discover online. If you don’t know to whom Katter’s mob or any of the others are giving the nod, good luck finding out. Their preferences may well decide the result! The policies of the two main contenders are not canvassed here, as the residents of Griffith are no doubt sick of leaflets, phone calls, SMS, and knocks on their doors. There have been suggestions of unethical and perhaps illegal push-polling and anonymous automated calls. Train travellers are also well serviced by political candidates, if not necessarily by governments. The Bullet Train Party, which is not directing preferences presumably because Thomas the Tank Engine isn’t running, at least has a trainspotting video. Given the disillusionment with the major parties (including The Greens) and the complexity of the voting system, it’s no wonder that nearly 6% of ballots cast for the House of Representatives in 2013 were informal. In addition, nearly 7% of enrolled voters did not turnout. The Australian Electoral Commission also estimated that more than one million eligible Australians are 'missing' from the electoral roll, approximately 7%. So nearly two in ten did not exercise their right to vote. So much for compulsion! People are dying around the world for democracy. Some Australians are just lying low. Presumably, aspiring Members of the House have been visible at the Gabba lately supporting the Brisbane Heat. However, many electors doubtless believe that compulsory, preferential voting is just not cricket.